Cash Wrap Counter - Silver w/Locking Drawer - Ships Same Day! Use this cash wrap counter to configure a fixture with display tables for retail stores and showcases to best present products to customers! 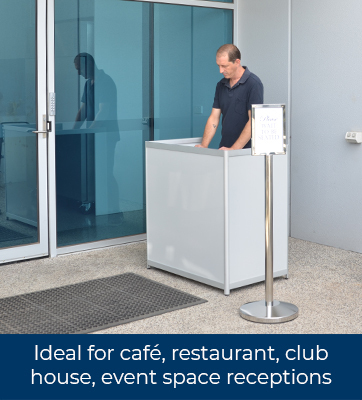 This display is also great for use as a maitre d' stand in restaurants, allowing hosts to greet and checkout customers as they enter your establishment. The 965 x 915 x 602mm register counter is well sized for configurations, and the silver colour works well with a variety of both decors and other fixtures thanks to its neutral finish. This cash wrap counter, one of many retail store fixtures, features a locking drawer as well, ideal for placing valuables or register trays to secure money. The drawer is 100 x 800 x 435mm to easily hold a tray of valuables. The top of the retail display is 865 x 560mm to hold a register or iPad and stand without issue, and has a cut-out with plastic insert to thread power cords and maintain a tidy look. This cut-out continues on middle shelf and on base to keep all cords neatly together and out of the way. For extra storage of stock or placement of personal items an adjustable 865 x 555 mm shelf within the 605 x 885 x 565mm interior allows you to easily separate the space for best use. 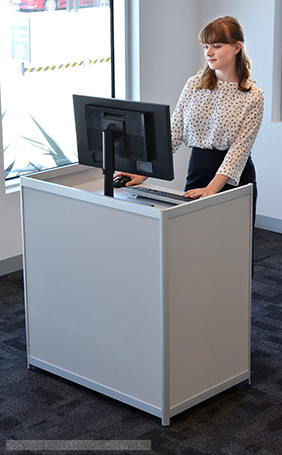 The service display stand weighs 38kg, with 16mm thick laminated MDF and an aluminium frame, both with silver finish, providing durability for a good return on investment. The bottom features (4) adjustable feet to level the display on uneven surfaces for stability. Purchase today by 2pm EST for same day Australia-wide despatch with this and most other in stock items when in stock, only from Slimline Warehouse!